Manila—(PHStocks)—Philippine stocks suffered declines Thursday, 30 January, on news of a further tapering of the US Federal Reserve’s quantitative easing program. The benchmark Philippine Stock Exchange index (PSEi) declined by as much as 85.72 points earlier in the session, but managed to cut losses by only 0.47% or 28.65 points at the end of trading to close at 6041.19 – maintaining its grip of the 6,000 level. Except for the Property sector, which ended flat, all remaining counters were back in the red, led by the Mining and Oil index (-1.28%). The Industrial index shed 0.83%, while the Holding Firms segment dropped by 0.68%. 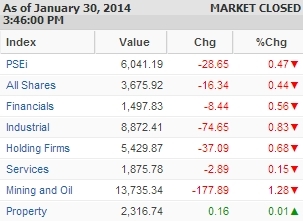 The wider All Shares index lost 0.44%. Value turnover reached PhP8.85 billion on 1.44 billion traded shares. There were 48 gainers against 109 losers, while 42 stocks were flat.